1. It’s been awhile since I have joined the realm of the 7 takers, but back at it today with a wide assortment. I am finding that even though I am now full time stay at home mom, I still love Fridays just as much!! 2. 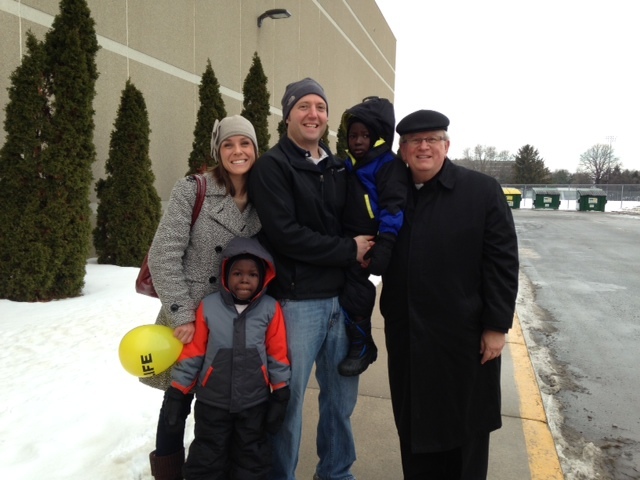 Have to share this wonderful family picture with the Bishop at our local March for Life. Although, the following Sunday the Bishop reached out to shake my oldest son’s hand at Church and he refused. Feeling a little mom embarrassment, but right now they are really shy when out in public. He made up for it and gave us a good laugh after Mass, when he mistook the Deacon’s gesture of excitement and gave him a fist-bump! 3. Enjoying the extremely rare moment of the boys napping and at the same time!! I stood still for a second, while my brain processed the event and didn’t hesitate with what I should do with the time. Hence, 7 takes. 4. Following #3 I have been trying to take the boys to Adoration once a week, which they really enjoy. We usually only last 15-20 minutes before they become restless, but last week they both ended up falling asleep at the 10 minute mark! Thinking of waking them up or trying to carry them both to the car, I opted for just enjoying the time in silence and prayer…for 80 minutes!! I guess God thought I really needed it!! 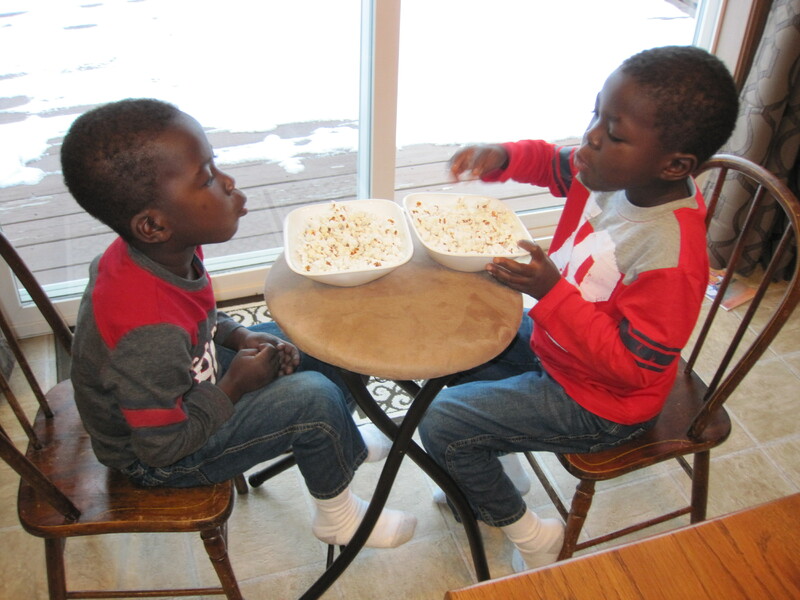 In good spirits and well rested, popcorn was enjoyed by all upon returning home! 5. Earlier this week our water heater went out leaving us with ice cold water for two days!! It wasn’t just lukewarm either, this was really, really cold! Even the boys were refusing to wash their hands. I couldn’t go that long without showering and soon realized the ice bucket challenge was nothing compared to the numbing temp! We had company coming over, so I also wanted to make sure our dishes were clean. I found boiling a couple of pots of water on the stove did the trick. Thankfully we were able to get it fixed, but made me realize just how much I take it for granted. 6. I am looking for suggestions of great books, resources, games that encourage language development. The boys are slowly catching onto English, but I am wondering if there is anything to help the process for them that I may be missing. Ready, go! 7. In addition to learning new words, the latest is parroting us…lets just say it makes me much more cautious of what I am saying and the tone I use. Continuing to keep me humble! Always fun to read your blog. Cool pic with Bishop Ricken! Love the adoration and popcorn combo!!! -scavenger hunts, but make them about people/actions to help with verbs. Like you could do a weekly list/daily list (kind of like “I spy”) and they have to find someone “blowing their nose,” “looking for something they lost,” “a hyper dog jumping,” etc. Have some kind of reward for finding everything—you could make the scavenger lists different so they aren’t looking for the same thing as their brother! -Have them ask you questions, no holds barred. I’m sure they are so interested in learning about you. But don’t correct the form of the questions. . .eventually they’ll learn how to “invert” their language and put things into question form. I found that my students were practically fluent when trying to figure out stuff about me, but not as expressive when asked questions themselves! -Lots of role-playing/make-believe. Dolls are great for acting out things and learning new words, and you can do it in funny voices. As for formal resources, I didn’t use many besides songs and books the kids were naturally interested. Immersion really is the best way to learn and you are already doing that. Once the boys have friends that will help immensely too, since they’ll try even harder to mimic their peers! This is so great!! Thank you for all of the suggestions!